Mehta, a former tenured psychology professor at Acadia University, was fired at the end of August after a months-long investigation that invited crowdsourced complaints about Mehta’s conduct inside and outside of the classroom. Even after the school commissioned two reports, there has been no formal finding of harassment or discrimination against Mehta. This is why Mehta wants the reports made public, which the school will not allow. Because Mehta was a unionized faculty member, it’s the union’s responsibility to defend him. Though based on a “process agreement” between Mehta, the school, and the Acadia University Faculty Association, it’s clear this isn’t happening. The document, published for the first time here, is supposed to be an agreement to the process by which Mehta will be disciplined. It was signed on August 1, 30 days before he was terminated. Except Mehta refused to sign it. And despite him urging his union to do the same, his supposed representative signed it anyway. Mehta’s union entered into the agreement that ultimately led to his dismissal without his authorization or consent. “The union’s lawyer spent two hours trying to convince me to sign it—and then the union’s president signed it anyway after I had refused,” Mehta told me in an interview. It also would have barred Mehta from even commenting on the case in media reports. In effect, Mehta’s union has endorsed the same gag order and lack of transparency that the university itself has attempted to impose on him. Why this is so concerning is that it essentially leaves Mehta without representation, and thus without viable recourse. He complained to Nova Scotia’s labour board under Duty to Fair Representation provisions, but was told this week that unions have the authority to make decisions in spite of the disagreement of the member impacted by the decision. In the eyes of Nova Scotia’s labour laws, the union is representing Mehta fairly because it is taking the case to arbitration. In the September 11 phone call from the labour board, he was told his complaint was unlikely to go anywhere because his union is representing him—even if that representation is only on paper. 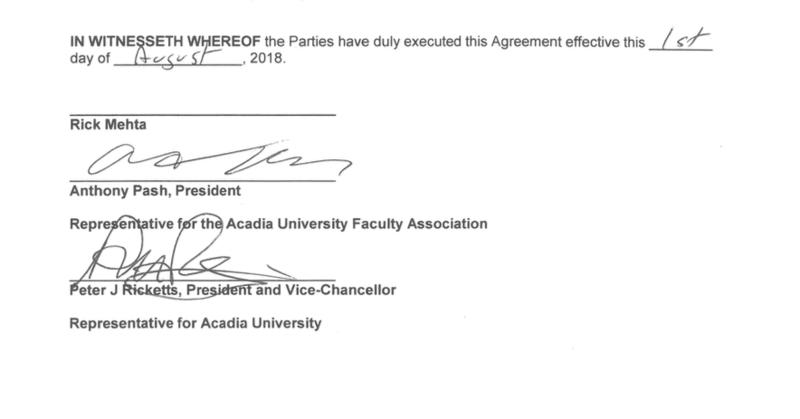 Full “process” agreement between Acadia University, Rick Mehta, and the Acadia faculty association. If it does not appear below, you can read it here. Update: I’ve launched a petition to Acadia University demanding it release the reports it’s using to justify Rick Mehta’s firing. Please sign and share it here. Acadia University psychology professor Rick Mehta has been fired six months after the school launched an investigation over allegedly “racist and transphobic” comments. The school said it was legally obligated to investigate in order to provide an environment free from harassment and discrimination. A brief statement from Acadia University confirmed Mehta’s dismissal this week. “We can confirm that Dr. Rick Mehta, a professor in Acadia University’s Department of Psychology, has been dismissed by the University. As this is a personnel matter, the University will provide no additional comments or respond to requests for further details,” an unnamed school spokesperson said in a Facebook message. Mehta says his letter from Ricketts speaks only in generalities and does not lay out specific examples of misconduct. The termination was based on two reports commissioned by the school—one by law professor Wayne MacKay, and the other by Dean of Science Jeff Hooper. Mehta says he’s unable to have copies of these unless he agrees “to be broadly gagged,” a claim Acadia would not comment on. Mehta insists people would see his termination to be unjustified were they to read the reports, which he wants made public. In the meantime, Mehta’s union has filed for arbitration to fight the firing. It’s difficult to speak to the university’s investigation process when so much of it was done in backrooms. However, Mehta was subjected to an orchestrated social media campaign encouraging students to speak out against him, regardless of their experiences. As of this point, his termination appears to be more about his political views than his teaching. I’ve met Mehta on a couple of occasions through the Society for Academic Freedom and Scholarship, in which we are both members. As a vocal proponent of academic freedom and free speech, Mehta has challenged conventional left-wing orthodoxy, a rarity from an academic in the social sciences field. There’s been no formal finding of any harassment or discrimination by Mehta. And the only questioning of his credentials and teaching has come from those who merely disagreed with his positions on several issues. “The students have not expressed in writing the precise details of the racist and transphobic comments, but it is clear from their interactions with me that they are extremely disturbed by your comments, some to the point of not going to class,” said Mehta’s department head, Rob Raeside, in a letter that Mehta himself shared publicly back in February. Mehta’s firing is the culmination of an ideological witch hunt rather than any genuine wrongdoing. Especially taking into account how the initial investigation materialized mere weeks after Mehta started challenging Acadia’s “decolonization initiatives.” It came days after he critiqued the role of feminism in one of his first year courses. As I wrote about earlier, academic freedom now has protection under the law in Ontario. In Nova Scotia, Mehta and his colleagues are not so fortunate.